The latest edition of the Chicago-Kent Faculty News is now available online. Click here to read about our faculty’s latest activities, in-progress research, and publications. “The market for public-private contracting is huge and flawed. Public-private contracts for services such as prisons and welfare administration tend to result in cost savings at the sacrifice of quality service. For instance, to cut costs, private prisons skimp on security. Public law scholars have studied these problems for decades and have proposed various public law solutions. But the literature is incomplete because it does not approach the problem through a commercial lens. This Article fills that gap. It considers how economic analysis of contract law, in particular efficiency theory and agency theory, bear upon the unique problems of public-private contracting. Click here to download the article from SSRN. Click here to read Schwartz and Kesan’s guest post at Patently-O. 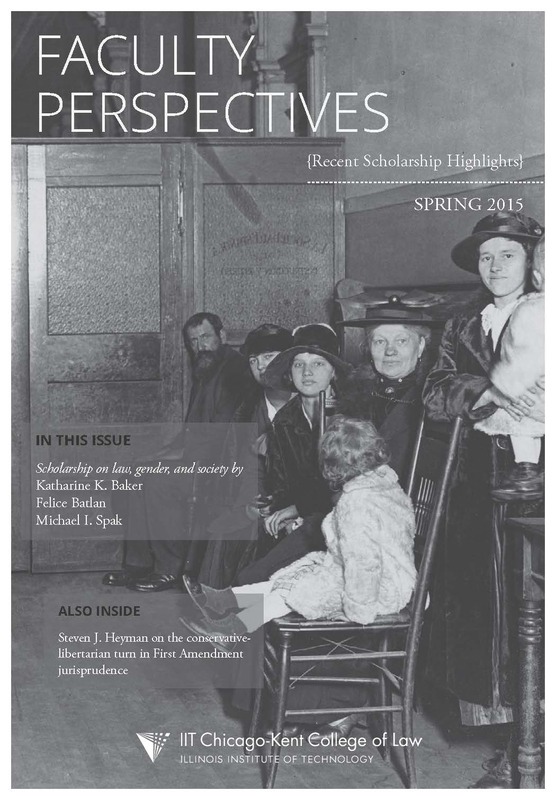 "This essay introduces the Chicago-Kent Symposium on Women's Legal History: A Global Perspective. It seeks to situate the field of women's legal history and to explore what it means to begin writing a transnational women's history which transcends and at times disrupts the nation state. In doing so, it sets forth some of the fundamental premises of women's legal history and points to new ways of writing such histories." Click here to read Professor Sheldon Nahmod’s sixth installment of his section 1983 primer, recently posted at his blog, Nahmod Law. In this post, Professor Nahmod discusses the importance of claim preclusion and issue preclusion in section 1983 cases. "This Article examines the doctrine of originality in U.S. copyright law and proposes a reconfigured, three-part test that can better analyze issues of first impression involving works created with new digital technologies. The proposed test, encapsulated by the concept of digital originality, provides much needed guidance to courts to address the increasing complexities of digital creations in the twenty-first century." Professor Joan Steinman was featured on an episode of Viewpoints Radio Podcast this week. She appeared with lawyer Anthony V. Curto in a segment titled, "Civil Suits: Can we make them move faster through the courts?" Steinman offered some possible measures to accelerate civil suits through the court system while maintaining a high level of justice for all parties involved. To listen to this free podcast, visit Viewpoints' podcast archives and click on the August 12th program, "Civil Suits: Can we make them move faster through the courts?" Visiting Assistant Professor Vinay Harpalani's latest article–"Diversity Within Racial Groups and the Constitutionality of Race Conscious Admissions," forthcoming in the University of Pennsylvania Journal of Constitutional Law–was cited several times in a recent amicus brief of the Society of American Law Teachers (SALT) in the Supreme Court case of Fisher v. Texas. The brief was written in support of the University of Texas at Austin (UT), whose use of a race-conscious admissions policy to increase student diversity is disputed by the petitioner. In addition, UT used one of Professor Harpalani's main arguments in their brief, referencing the importance of "diversity within different racial groups" in breaking down racial stereotypes in an admissions context. Read Professor Harpalani's article on SSRN here; read SALT's amicus brief here. The Supreme Court is scheduled to hear Fisher v. Texas on October 10.